If your guinea pig twists his neck oddly and it stays that way, it's known as wryneck. It doesn't necessarily mean something is wrong with the neck itself. Instead, it's a common symptom of pneumonia or ear infection in your pet. If your guinea pig exhibits this constant head tilt, get him to the vet at once for diagnosis and treatment. Torticollis, the technical term for wryneck or twisted neck, often occurs when your guinea pig suffers from an ear infection. Your pet's neck might be so twisted that he has difficulty staying upright. That tilting results from an infection that spreads into the middle ear, disturbing your guinea pig's equilibrium. People and other animals with ear infections usually respond well with antibiotic therapy. That's not so easy with guinea pigs, as many common antibiotics cause serious, even fatal, side effects in the species. Your vet might prescribe enrofloxacin, marketed under the brand name Baytril, to combat your guinea pig's middle ear infection. That otitis media, as a middle ear infection is known, requires long-term antibiotic administration. Your vet might give you oral antibiotics as well as antibiotic eardrops to combat the infection. Because oral Baytril can cause make a guinea pig lose his appetite, your vet might also prescribe special food that you might temporarily need to force-feed through a tube to ensure your pet's gut keeps moving. That twisted neck could also indicate pneumonia, a primary cause of guinea pig death. Ear infections often accompany the disease in guinea pigs. Besides wryneck, other pneumonia symptoms include breathing difficulties, nasal or eye discharge, loss of appetite and lack of movement. Pneumonia is a veterinary emergency, so bring your pet to the vet immediately. Your vet cultures any discharge to determine the agent causing the disease. In guinea pigs, it's often Bordetella bronchiseptica or Streptococcal pneumoniae. While many guinea pigs don't survive pneumonia, some can with aggressive and appropriate antibiotic therapy. Although you can't always prevent pneumonia or ear infections, good husbandry practices lessen the risk. 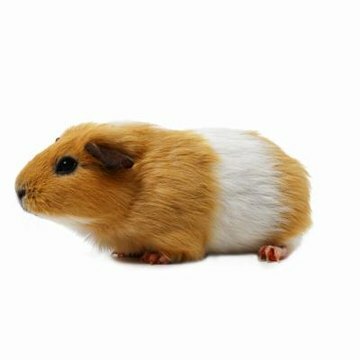 Avoid stressing your guinea pig as much as possible. Keep his cage away from excessive noise or areas of constant activity in your household. Don't put the cage in direct sunlight or a drafty place. Keep his cage clean, using wood shavings or shredded newspaper as bedding. In addition to having fresh water always available, your pet needs a constant supply of timothy or grass hay to keep his intestines moving and his continuously growing teeth worn down.